You�ve heard of all the interest in bird watching and nature viewing and wonder if your property might have something to offer the nature tourist. Perhaps that old house on the back forty near the creek could be fixed up as a cabin, or someone might actually be interested in paying you to come see prairie dogs, burrowing owls, deer and coyotes. Maybe the caf� in town or down the street would be interested in collaborating on a bed and breakfast deal. There�s the museum in town. You�ve heard how nature tourists also love to visit cultural and historical places. Hmmmm, there may be some networking potential here! This page of Natural Kansas is specifically designed to help you determine if you�ve got what it takes to attract visitors and derive some income from travelers interested in nature-based tourism. Here you will find some pointers on what things to consider in setting up a wildlife attraction and how to consider the conservation needs of the wildlife of interest. Remember that the nature tourist also enjoys a wide assortment of active experiences, which could involve the land and the people of your area as well as the wildlife. "The Dance of the Prairie Chicken" and "Wetland and Wildflower Wonder". Remember, maintaining your leks will be central to your operation, so you must protect your resource. 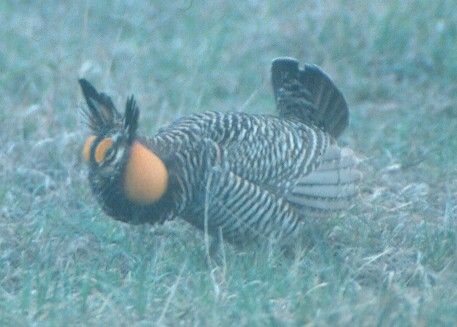 For information about range management practices which are beneficial to prairie chickens, contact your county Natural Resource Conservation Service office or the nearest regional office of Kansas Department of Wildlife and Parks. To find them, use the links below. Most leks are on fairly exposed hilltops or ridges. Being able to approach from behind a hill, plum thicket, fence or other obstruction will help. Figure out an approach to the lek that is as hidden as possible from the birds. Research has shown that repeated disturbance can cause lek abandonment. Your blind can be composed of anything from burlap attached to barbed wire fences, to a horse trailer in temporary use, to a constructed blind. A blind can be located as close as the edge of the lek but you should first place it a short distance away and gradually move it closer so the birds get used to this new part of their landscape and don�t abandon the lek. The blind should be placed on the east side of the lek in a way to optimize light conditions for photography and viewing. This is very important as the best opportunities will occur in morning and your clients will want to see the brilliance of the colors with their eyes and record it with their cameras. The blind location should try to incorporate other landscape and wildlife features if possible. This certainly would include good viewing vistas as well as possibilities for seeing prairie dogs or other wildlife. Make sure the seats within the blind are moveable and won�t sink into soft ground easily. Chairs with runner-type legs work better than straight-leg chairs. Plastic 5-gallon buckets can do the job too. Consider providing accessory materials for clients such as a bird list for the area or county you are in, wildflower list, field guides, extra equipment such as binoculars or spotting scopes, and extra clothing and raingear just in case. It can be pretty chilly sitting in the blind for a few hours in the early morning in spring. Stadium bags or warm blankets will be appreciated, and a few extra breakfast bars and water would be handy as well. First aid supplies and the ability to communicate via cell phone are good to have. If no cell phone signal is available, thought should be put into how to make contacts as soon as possible should emergencies arise. Walkie-talkies are very affordable nowadays. This is early morning activity. Get everyone into the blind an hour before sunrise. Make sure a bathroom break is allowed as close to the time you enter the blind as possible. Clients should understand they may be there for at least two and possibly three hours so that booming chickens are not disturbed. Sometimes leks have visitation from hawks or coyotes which causes the birds to disperse naturally and these are excellent times for clients to exit the blind if they have had enough of the adventure by then. Consider secondary activities or satellite nature sites. This could involve a visit to a nearby prairie dog town after watching the prairie chickens. Or it could involve a walk through other habitats to view wildflowers or other wildlife. Developing the potential for other features and activities will create other possibilities for value-added profit and also increase your flexibility in case of a change in the weather. Farming and/or ranching activities may be part of the mix too. Fortunate is the farmer or small town that has a local wetland. This can be turned into a wildlife viewing destination and cash in the pocket. Duck hunters certainly know the values of wetlands, but the landowner can also take advantage of birders who love watching the wildlife of the marsh. Combined with the other natural features of the area such as the local wildflowers, and you have an excellent offering of nature�s desserts for the hungry nature tourist. A blind set up on the edge of a marsh similar to that recommended for prairie chickens will add tremendously to the value of the viewing experience. A boardwalk to a blind built over the wetland is even more attractive but certainly is more costly to develop. Early morning access to a wetland viewing blind is probably the most attractive situation. Many times, fog will be lifting off of a wetland in the morning and adds a delightful touch to the experience. However, evening visits, with the opportunity to enjoy a beautiful sunset as well as the wildlife, are a great value-added feature. The added opportunity for evening viewing at the wetland adds additional flexibility for trip packages. Morning viewing trips can be combined easily with other activities including wildflower and nature walks. If the opportunity for horseback riding and/or mountain biking is present, those activities may also be in the mix of possibilities. Making provisions for extra supplies, field guides, and bathroom considerations will be just as important for early morning wetland wildlife viewing as they are for prairie chickens. See the discussion in �The Dance of the Prairie Chickens� above. As is also the case for the landowner who is bringing clients to watch prairie chickens, other natural amenities, both on- and off-site, allow for value-added opportunities. This would include farming/ranching activities, visits to prairie dog towns with burrowing owls and other wildlife, area museums, special cultural events and other local attractions. It�s a good idea to conduct a thorough evaluation of your potential assets. If you have a biologist available either from an area school, the Kansas Department of Wildlife and Parks, another agency or through an acquaintance or company, you may want to utilize the form below for a thorough inventory of what you have to offer. Click on the icon to download the �Natural Resources Inventory� self-assessment form. It will give you an idea of the features and amenities that are considered important in evaluating and offering nature tourism possibilities. Once you are ready to serve clients, click on the icon to the left to download the application form to have your business listed on the Natural Kansas website. The form includes the criteria for listing as well as how the process of evaluation works. We look forward to hearing from you! Click here to see the different Kansas businesses that are already listed. See the county bird lists on this web page to obtain bird lists for your county and adjacent counties. "Nature Tourism: A Guidebook to Evaluate Enterprise Opportunities" can be ordered from Texas Cooperative Extension here. Visit Watchable Wildlife, Inc. for insight into the scope of nature-based tourism nationwide. 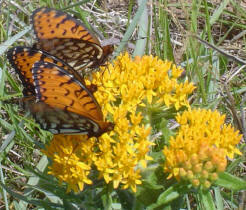 See our listing of Watchable Wildlife links for information on WW activities in other states.